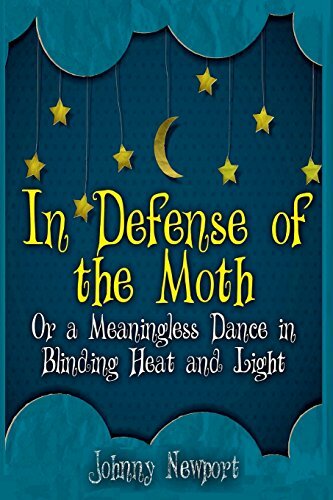 Article first published as Interview: Johnny Newport – Author of ‘In Defense of the Moth: Or A Meaningless Dance in Blinding Heat and Light’ on Blogcritics. Johnny Newport has been re-tweeted by Bun B and Waffle House respectively, which he counts as a couple of his biggest accomplishments. He studied at the University of Texas at Austin and has spent the last few years in The Writer’s Path at SMU. In 2015, he was published in the MFA journals Euphemism, Limestone, and The Vehicle. Sheri: Welcome, Johnny, and thank you for being here today. Why don’t you start by telling our readers a bit about yourself and your journey to becoming a published author? Johnny: Thank you for having me. My journey is not a unique one, I grew up a reader and at some point in college I made a naïve determination that I should (and could) write, despite never having really done so. I remember my first failure pretty distinctively; after a drunken night on 6th Street in Austin, my best friend and I came back to after-party and somehow or another ended up buying round trip tickets to Aruba, on what I assume was a lark. Later I sold my car for $500 and absconded to Aruba for 14 days without telling my family. I packed a blender and a green, wide ruled Mead notebook in which I wrote, “I’m going to write the Great American Novel.” I took the notebook to the beach the first day but as soon as I started to buzz I forgot all about those aspirations and instead tied on a two week spree. That green notebook was left on the beach to be weathered and beaten by the elements before being buried completely by sand and time. I think that is pretty symbolic of what happened with my journey to write and be published as I didn’t start to try and write professionally again for another ten years. Sheri: What is “In Defense of the Moth” all about? Johnny: In Defense of the Moth is the story of Johnny Gomez, a modern, disillusioned man who feels guilt for desiring not to abide by societal standards, but instead for self-destructive behavior. Also, a concept that I’ve been chewing on for a while that I’ve spent a lot of time thinking about is privilege, what that looks like for a guy like Johnny Gomez, and how the idea of privilege gives him the opportunity to subvert the norms of society to justify a more creative way of life. Ultimately, the book employs allegory and is a Platonic apology (apologia) for alcoholism and acute insanity. Sheri: Where did you get your inspiration to write this story? a.) My alter ego and nickname was Moth Ankles (#MothAnkles), which was derived both at once from one of my favorite rappers Ghostface Killah (his nickname Cocaine Biceps spawned the original moniker Meth Ankles) and Norm Macdonald (the name Meth Ankles evolved to Moth Ankles as I became infatuated with his infamous Moth joke). b.) After a particularly painful night, I decided it was time to dry out for a bit. Once a year I liked to try and take a month off from the drinking and drugs under the banner of “30 days of clarity”. I decided I needed a good 6-month sabbatical and rationalized it by thinking, ‘Hey, even Formula-1 cars need tune-ups.’ During that time I tried to revert to my tried and true coping mechanism of rapidly reading books, but I could not focus my mind on much of anything, much less on the words, and I would get through a dozen pages before giving up. I did this with 6 or 7 different books of varying genres and styles and that’s when I knew I had to write. Sheri: Tell us about the protagonist in the book, what motivates Johnny Gomez? Johnny: Johnny is motivated by emptiness and the meaninglessness that he finds encompasses his life when the moon disappears. He is then motivated to recapture meaning and the slices of happiness he once had or conversely, to discover new modes which would entail the acceptance of the moon being lost to him forever. Read the book and find out which way it goes! Sheri: What is the significance of Johnny’s obsession with the moon to the story? Johnny: As a man with a passion for astronomy and moon gazing, the moon represented his raison d'être. Imagine you woke up tomorrow and the only thing in your life that stimulates your pleasure center or gives you a purpose, whether that be your children, your career, your writing, your sports team, or whatever, had just disappeared. Would there be an obsession born from that scenario? Sheri: What kind of reaction to your writing do you most seek from your audience? Johnny: I want my writing to make the reader think and stimulate consideration. I purposely leave things open to interpretation because I don’t appreciate the heavy handed and the hackneyed and that association is the last thing I’d want to be known for…at the same time I do have what I think is a thoughtful and serious philosophy that I’d like the reader to entertain. Sheri: What is the best advice you have ever received, about your writing or life in general? Johnny: I’m afraid I don’t follow this advice enough, but my earliest writings overwhelmed with description and mixed metaphor. Sheri: What advice can you give to aspiring authors? Johnny: I honestly don’t feel fit to give any original advice to aspiring authors so I will dispense with the vanguard advice to be a regular, lifelong reader. Sheri: What’s next? Do you have plans for another novel? Johnny: I’m glad you ask! I am finishing the first draft of a collection of short stories. The short story collection is interesting (to me) in that I am writing in an experimental style; a single narrative which is composed of my short stories which are interconnected by the segues of the (unnamed) narrator. This collection ranges from urban realism to fabulism and is told through the prism of an unnamed narrator. The thematic glue for the collection is this narrator who toes the line between haught (or at least a well constructed ego) and a deeply-flawed, human vulnerability familiar and worthy of our sympathy. Johnny: The Universe, it seems, has a refined sense of irony in that my ardent justification and rationalization for vice and insanity, written in the throes of my addictions, is published and I’m sober. Of course, right? Sheri: Johnny, it has truly been a pleasure having you with us today. Thank you so much for stopping by and giving us some insight on your book. I look forward to seeing more work from you in the future. Johnny: Thank you for the opportunity to share and thanks for the kind words.